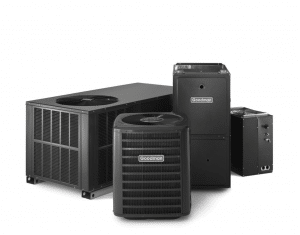 Since 1982 Goodman has been building quality Goodman brand air conditioning and heating equipment. Goodman brand air conditioning and heating systems meet the highest industry standards. Goodman is focused on providing high-quality products at an affordable price, and protecting them with some of the best warranties in the industry. This clear focus has led to Goodman’s being a leading unit manufacturer of residential and light commercial heating and air conditioning products and systems in North America. They also own the Amana brand. Goodman manufactures furnaces, air conditioners, ductless mini-split systems, packaged units, controls, heat pumps, air handlers and more. Many of which are energy star qualified and made in the USA. The GSX13 is a 13 seer unit, single stage compressor with not many features. The GSX14 is a 14 seer unit, single stage compressor with added high and low pressure switches. The SSX16 is a 16 seer unit , single stage compressor with added high and low pressure switches. The DSXC18 is an 18 seer unit with high and low pressure switches, two stage compressor, built-in diagnostics, and ComfortNet™ Communications System compatible. We consider Goodman our value line, but they produce a great unit for the money as well as a great warranty*. The compressor in the GSX14 and up models is covered by a Lifetime Limited Warranty*. If the compressor ever fails, a new one will be provided to the original purchaser of the central air conditioning system as long as they live in the same single-family residence. All functional parts area covered by a 10-Year Parts Limited Warranty*. Goodman requires registration for full warranty to be active. Otherwise most units have a 5 year warranty. See Goodmans web site for specific warranty details*. When it comes to installing, servicing, or repairing a Goodman air conditioner or furnace choose the experts, Max Mechanical. We service Arlington, Dallas, Fort Worth and the entire DFW area. Do you need a price quote on the installation of a new Goodman air conditioning unit in your home or business? Call 817-459-4100 or contact us online for a free estimate. Are you looking for replacement parts for your Goodman HAVC or furnace? Call Max Mechanical, the Carrier replacement specialists, at 817-459-4100 or contact us online for a price quote.